Phra Nang Beach is surrounded by stunning limestone cliffs and is located on the southern most tip of the Railay Peninsula, just south of West Railay. Out of the four beaches within this peninsula this beach would have to rate as the best with calm clean waters. The limestone cliffs that tower above the beachfront, provide shade from the hot sun. 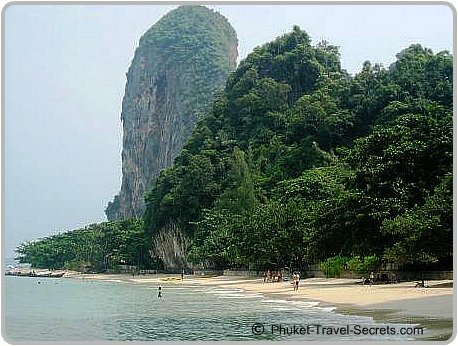 From the beach there are beautiful views across to the very popular Poda, Chicken and Tub Islands which lie in the distance. Closer to shore is a small island called "Happy Island" which you can walk to at low tide and is a good spot to go snorkelling. 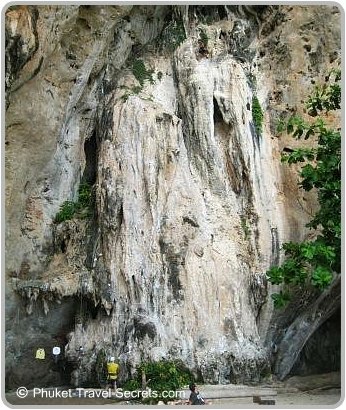 At the southern end of the beach is a tall limestone cliff that contains the famous Princess Cave also known as Tham Phra Nang Nok or outer cave that is said to be the home of a mythical sea princess. For those who are up for a hike, inside the cliff is a hidden lagoon called Sa Phra Nang or Holy Princess Pool which can be reached by following a trail into the side of the mountain. The climb is a bit challenging, but that's what makes it so much fun. 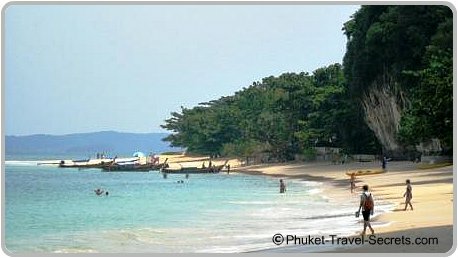 Phra Nang is also known and shown on some maps as Princess Cave Beach or Phranang Cave Beach; all these different names can be somewhat confusing!!! Many people visit Phra Nang as part of a day trip from one of the other beaches as it is the first stop on the Krabi 4 island tour. While other visitors just come to spend the day lazing on the beach or to explore and admire the stunning scenery in this beautiful part of of Krabi Province. The only accommodation you will find at Phra Nang is the luxury five star Rayavadee Hotel. The location of this hotel alone is superb, an ideal spot for a romantic getaway or wedding venue. There is also budget hotels and resorts located nearby on West and East Railay beaches as well as well cheap bungalows at Ton Sai Beach. Whilst on the beach, keep your eye out for the sandwich boats that arrive at the northern end of the beach in the mornings. The ladies on-board the long-tail boats sell freshly made sandwiches, beautiful BBQ corn and fruit shakes, all the food is made fresh and is relatively cheap. 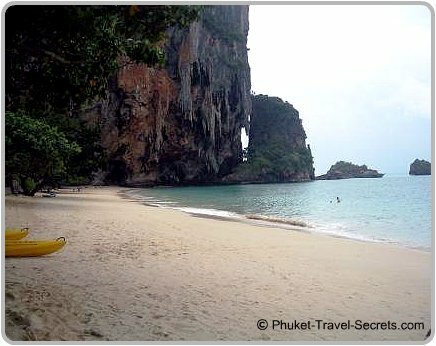 Phra Nang is definitely one of my favorite spots and one of the best swimming beaches in Krabi. The best time to go to the beach is before lunch as it seems to get busier in the afternoons, although it's easy to spend the entire day here. From Ao Nang, longtail boats can take you directly to Phra Nang beach. The boat ride takes around 10 to 15 minutes. 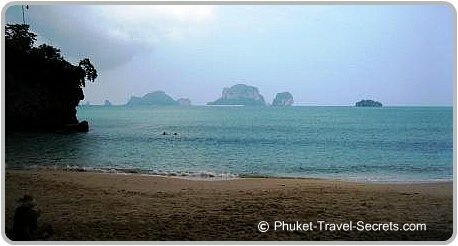 If you arrive at West Railay you will need to walk across the peninsula to East Railay and then follow the path along the beach and around the base of the cliff towards the Rayavadee Resort until you reach the beachfront of Phra Nang. 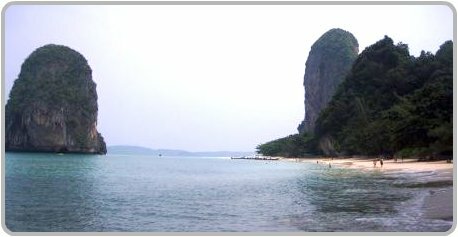 If you are already staying at one of the neighboring Railay beaches, follow the path from East Railay around to Phra Nang. Longtail boats From Ao Nang to Tonsai, West Railay or Phra Nang Beaches cost 100 baht per person or 200 baht return. This area is undoubtedly one of the best attractions in Krabi, have a read and see what other travelers have to say about it on TripAdvisor.